Tactical gloves are useful for more than just law enforcement and military operations. They’re the best choice when you need something that will protect your hands without interfering with grip and dexterity. To help you find the right pair for your needs, we put together this tactical gloves review by researching the best brands and top-selling gloves. Before we get started, let’s take a close look at the key factors you should think about when shopping. Cold Weather: Technically, none of these gloves are very well-suited for cold weather and for good reason. Any bulky lining or insulation would interfere with grip and dexterity. That said, some of these are better in the cold than others. 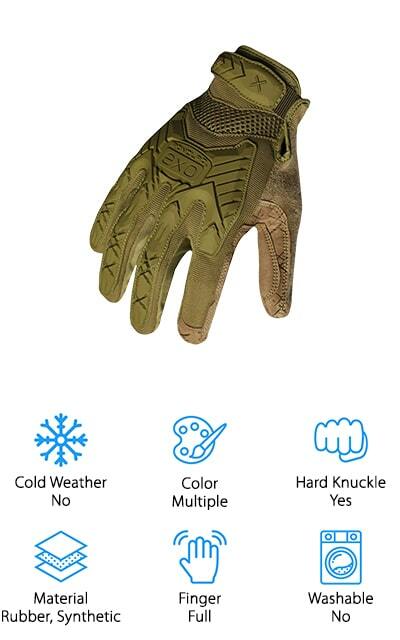 Color: These gloves come in colors that have a bit of a traditional military feel. You can find each one in black and there are a few that are available in army green and various shades of brown, like camel or sand. 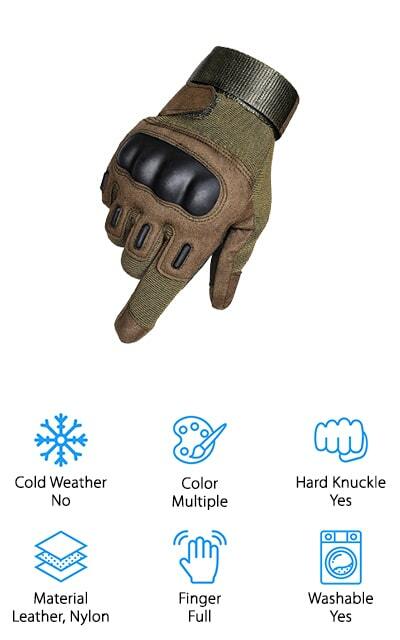 Hard Knuckle: Hard knuckles are an essential feature when it comes to tactical gloves. They’re commonly made of rubber that’s firm enough to prevent scratches and scrapes but soft enough to remain comfortable and not interfere with movement. Material: These gloves are made of a lot of different materials, including leather, microfiber, spandex, and nylon. Each pair is different but the main thing is to choose materials that are lightweight, comfortable, and breathable. Quick-drying is a bonus. Finger: Some of these gloves have full-finger designs while others are only half-finger. There are even a few that are available in either style. The difference? Full fingers provide more protection while half fingers provide a little bit more dexterity. Machine Washable: Not all of these gloves can be tossed in the washing machine but a lot of them can. It’s important to use cold water and avoid the dryer as the heat and tumbling can cause damage. 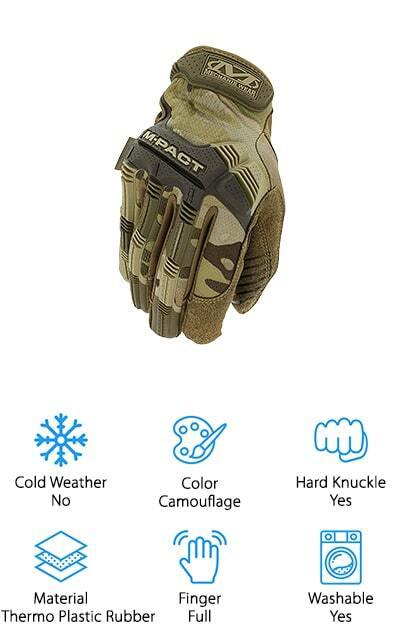 Now that you know a little more about tactical gloves, let’s take a look at our reviews. If you’re in a hurry, check out our top and budget picks. They’re the first 2 items on the list and are a great way to see the range that’s available. Stick around as long as you can, all of these products are pretty special and you never know which one will suit you. Alright, are you ready? Let’s get started. Our top pick is a great pair of hard knuckle tactical gloves from FREETOO. These heavy-duty gloves protect your hand from abrasions and scratches and fit snugly on your fingers and palms. They also have an adjustable Velcro wrist so you can make sure you always get a good, snug fit. We like that these gloves aren’t stiff or bulky and allow for maximum movement and dexterity. The material is vented and breathable which makes them a great choice for hot weather. A reinforced dual layer synthetic leather palm and double stitching add durability and the anti-skid surface provides amazing grip. 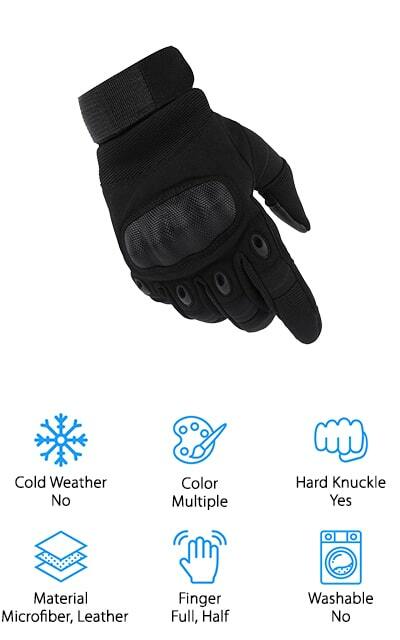 These gloves are great for a lot of applications, including camping, hunting, shooting, or as an awesome pair of work gloves. That’s not all, they’re also covered with a 3-month warranty. Our budget pick, the Mechanix Wear M-Pact Tactical Gloves, are some of the best tactical gloves for shooting we found in our research. Actually, they’re great for any type of outdoor use. The TPR knuckle guard and finger guards help prevent injury by reducing impact and preventing abrasions. The fingertips are reinforced for durability but also have an embossed pattern that improves your feel and dexterity. Padded palms help absorb and distribute impact and the camouflage design helps you stay hidden when you’re out hunting. These gloves also feature TrekDry, a breathable material that keeps your hands cool and dry while you’re out in the field. These gloves are available in a range of sizes, too, from small to XXL which makes this a great choice for just about anyone. 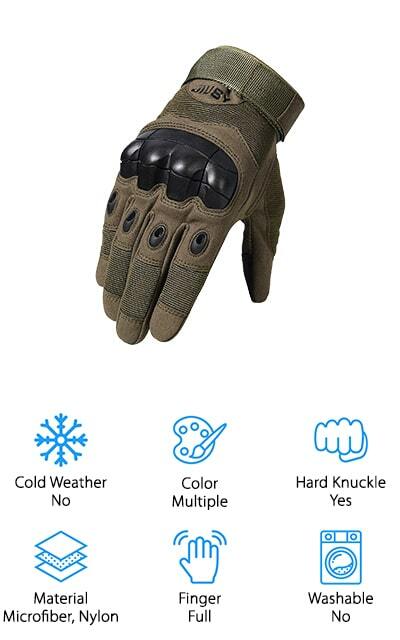 A great pair of touch screen tactical gloves are these ones from JIUSY. They have an anatomically shaped one-piece thermal plastic rubber knuckle guard to protect against impact and abrasions. The best thing about this is it’s not too hard or stiff but it’s also not so soft that they don’t do the job. They have just the right amount of cushioning for protection and they don’t impact your dexterity. The material is breathable and keeps your hand cool while the adjustable wrist makes sure you always get a snug fit. While these gloves are not waterproof, they do dry quickly and won’t get soggy or bogged down with water. The careful stitching is durable and strong and the palm reinforcement gives your hands a little bit of extra padding and protection. TitanOPS Shotting Gloves are a superb pair of military tactical gloves that feature durable full fingers and hard knuckle shields to protect against abrasions and scratches. 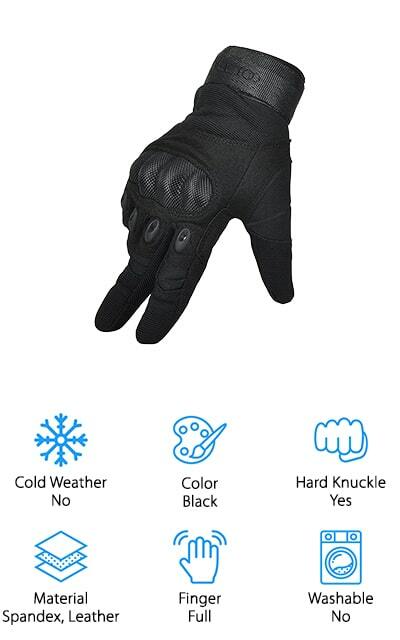 They’re made with a unique mix of materials that includes microfiber, leather lycra, and nylon that keep your hands warm and protected but they’re also soft, flexible, and allow your hands to breathe. In other words, they’re really comfortable, too. They’re machine washable and dry really fast although you don’t need to worry about washing them too often. Why? Because they’re bacteria resistant and odor-free. A reinforced palm provides extra durability and grip while the adjustable wrist strap makes sure you get a close fit. These are great gloves for hunting, cycling, riding, or any activity with outdoor exposure and they’re available in black, tan, and green. If you’re looking for a great pair of green tactical gloves, check out the accmor Tactical Half Finger Gloves. They’re available in black and tan options as well. The knuckles have an anatomically shaped protective shield made of thermal plastic rubber that protects against abrasions without limiting movement or dexterity. The palm features an anti-skid surface and a wear-resistant liner to increase comfort and extend the life of the gloves. Microfiber and stretch nylon material are breathable and quick drying and a velcro strap adjusts to make sure you always get the best fit. These are a great choice for a range our outdoor activities, including shooting, military drills, paintball, hiking, or even driving. The half-finger design gives you the protection you need while allowing your fingers a full range of motion. Fantastic Zone Tactical Gloves are available in both full and half finger versions. 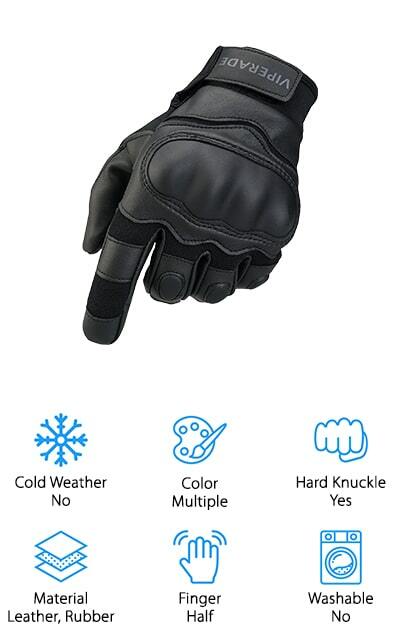 They’re made of high-quality treated leathers, stretchy nylon, and breathable spandex which gives these gloves a fit that’s both snug and flexible. The adjustable velcro wrist strap lets you get the right fit, every time. There’s more. On the back of these gloves is a strategically placed piece of molded foam that protects the back of your hand as well as pre-curved knuckle protection. This ergonomic touch provides greater dexterity and adds less bulk to the glove so you can grip and grab anything you need whether you’re shooting, hunting, or exploring outside and the whole design is wear resistant and quick dry. One more thing, there are army green, black, and camel color options available, too. Next up are these tactical gloves from Valpeak. They’re made with a microfiber shell, double layer palm, and hard rubber knuckle to provide comfortable protection and grip. The palm is actually one thing that makes these a great pair of shooting gloves. With the right fit, they decrease shock and scratches and the anti-skid texture makes sure they do it without interfering with your grip. An adjustable velcro wrist strap makes sure you get a snug, secure fit every time. There’s a rubber vent on the third part of the finger that lets your hands breathe which helps keep your hands as dry as possible. While these gloves aren’t waterproof, they do dry quickly which makes them a great choice for any outdoor adventures. One more thing, they come in black, green, and tan color options. REEBOW TACTICAL Gloves have a hard, molded knuckle and a reinforced palm that are designed to stand up to heavy-duty use. One of the best things about them is they provide sufficient protection while remaining flexible. That means that they don’t affect dexterity or range of motion. 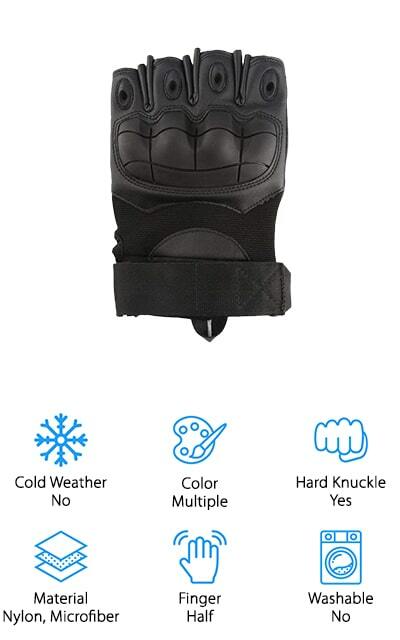 Durable stitching and high-quality materials extend the life of these gloves and a breathable top and adjustable wrist make sure you always stay comfortable. Plus, they’re lightweight and anti-slip design makes sure you always get a solid grip. While these are not machine washable or waterproof tactical gloves, they do dry quickly when exposed to water. 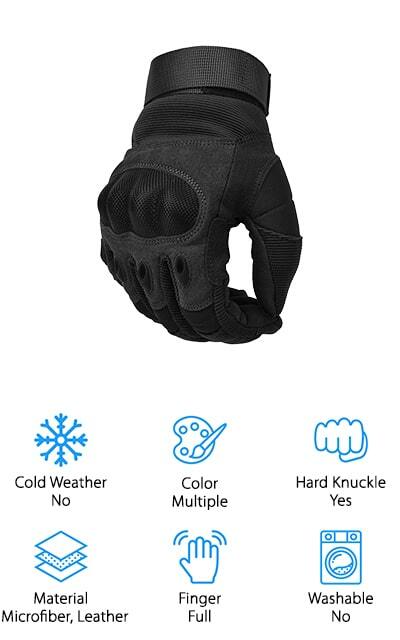 These are a great pair of gloves if you’re looking for impact or abrasion protection and they’re available in black, green, or tan so you can match the rest of your gear. If you want a pair of PIG tactical gloves but can’t bring yourself to spend the money, the Viperade Mens Tactical Gloves are a good low-cost option. They’re made of artificial leather and knitted fabric for a breathable, fast-drying design. A non-toxic hard rubber shell over the knuckles brings heavy-duty protection against scratches and abrasions. Plus, the palm is reinforced for added wear-resistance which makes this a great choice for outdoor sports or other adventures. One of the best things about these gloves is that they’re made of odor-free materials and have a functional vent design so they keep your hands dry and limit sweating and odors. Adjustable wrists make them easy to get off and on and help you make sure you get a secure, snug fit every time. 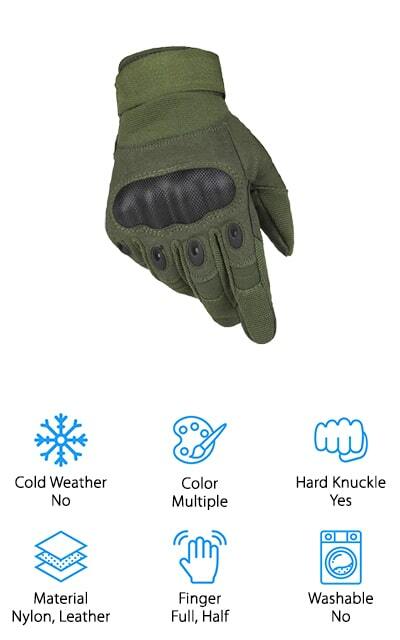 We’re calling the Ironclad Tactical Impact Gloves the best tactical gloves for cold weather because they have a synthetic leather construction that will do the trick when the temperature stops to drop. That said, they’re not insulated so they aren’t necessarily warm tactical gloves meant for sub-zero temperatures. Impact protection and thermoplastic rubber on the back of the hand and protects your knuckles and metacarpals. And get this, Ironclad uses a 16-point measurement system that makes them some of the best fitting gloves around. They fit snugly without adding any unnecessary bulk and feature an adjustable velcro wrist strap and reinforced palm for vibration reduction. You can toss these gloves right in the washing machine and they won’t dry out or shrink. While they’re not waterproof, they do dry quickly.